It's a classic. 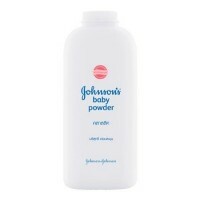 JOHNSON'S® Baby Powder helps to eliminate friction while keeping skin cool and comfortable. It's made of millions of tiny slippery plates that glide over each other to help reduce the irritation caused by friction. © 2007 Jeban.com, all rights reserved. Copyright © 2007 Jeban.com, all rights reserved.